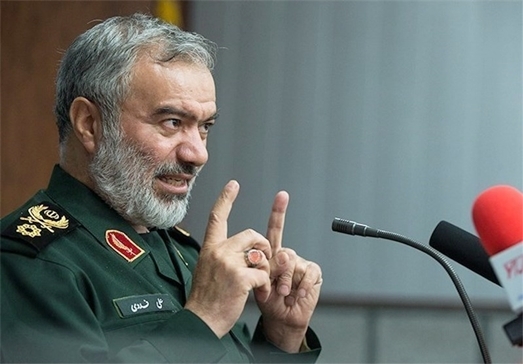 The Islamic Revolution Guards Corps (IRGC) Navy Commander called on the US forces to put an end to their presence in the Persian Gulf before any problem arises in the region. “What has been in place in the Persian Gulf for years and has not changed is the powerful presence and intelligence supremacy (of the IRGC) in the Persian Gulf and the Strait of Hormuz,” Rear Admiral Ali Fadavi said in a ceremony held in the southern port city of Bushehr on Tuesday. He further denounced the US naval presence in the region, saying that over the past 28 years, the US has been the cause of insecurity in the regional waters. The Iranian commander emphasized that in order to prevent any problems in the “important Persian Gulf region”, the Americans had better leave the waters in a dignified way. The Islamic Republic of Iran has always been against the presence of foreign powers in the Persian Gulf. Back in December 2015, Leader of the Islamic Revolution Ayatollah Seyed Ali Khamenei underlined that security of the Persian Gulf region comes within the purview of the regional countries alone, and dismissed the US claim of seeking security in the region. “The Persian Gulf’s security relates to the countries of the region which have common interests, and not to the US. So, the security of the Persian Gulf region should be provided by the countries of this region itself,” the Leader said at the time.